This Monday, allies and immigrants are asked to strike from work, school, shopping (including gasoline purchases), and to close their businesses on that day in solidarity. In Grand Rapids, people are asked to gather at Garfield Park for a program and a walk toward Calder Plaza. Monday, May 1: Join the immigrant community in a strike: don't work, shop, or go to school. Close your business in solidarity. Hear speakers, then walk toward Calder Plaza. This will be a no-arrest action. Learn more through the Facebook Event. You can also text "Huelga" to 41411. On Thursday, April 20, at 12 p.m. I joined a group of immigrants and allies in the Calder Plaza for a peaceful demonstration organized by Movimiento Cosecha GR. Together we marched north to face the Office of Immigration and Customs Enforcement (ICE) at 517 Ottawa. With two other allies, Jay DeShane and Tim Mengel, I held a banner that spanned the width of the street. 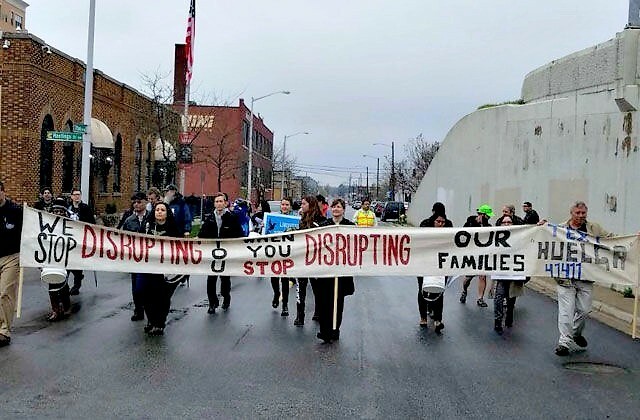 It said, “We Stop Disrupting You When You Stop Disrupting Our Families." The banner also instructed, "Text ‘Huelga’ to 41411.” Huelga is Spanish for strike. There is no parallel enforcement for the hundreds of thousands of U.S. employers who hire these workers, the many federal, state, and municipal agencies that benefit from their payroll taxes, or the hundreds of thousands of U.S. companies that depend on their business as customers. The number of deportations increased greatly under Obama’s presidency, and Trump has made clear he intends to persecute the immigrant community even more. As various speakers called for “dignity, respect, and permanent protection for immigrants,” our group first blocked Ottawa Avenue near the ICE office, and then moved to the Ottawa exit ramps descending from I-196. This served to back up the ramps and eventually the freeway. Police were quickly on the scene as most of the group retreated to the sidewalks. When the police directed DeShane, Mengel, and I to move out of the street, we were arrested for "failure to comply." 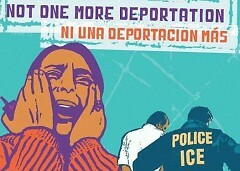 To show the immigrant community that we are with them, now and for the national strike on May 1st: A Day Without Immigrants/Un Dia Sin Immigrantes. This Monday, May 1, 2017, allies and immigrants are asked to strike from work, school, shopping (including gasoline purchases), and to close their businesses on that day in solidarity. In Grand Rapids, people are asked to gather at Garfield Park for a program and a walk toward Calder Plaza. There will be similar events in different cities across the nation. To show solidarity for our neighbors who are being detained. What I went through for a few hours deepened my compassion for those who are pulled away from their homes, their families, and the lives they have built, often after decades of living in our communities. Even a short incarceration is a loss of freedom that is felt deeply - no contact with loved ones, no choices over what to eat, no dignity when it comes to basic needs like using the bathroom or cleaning up. 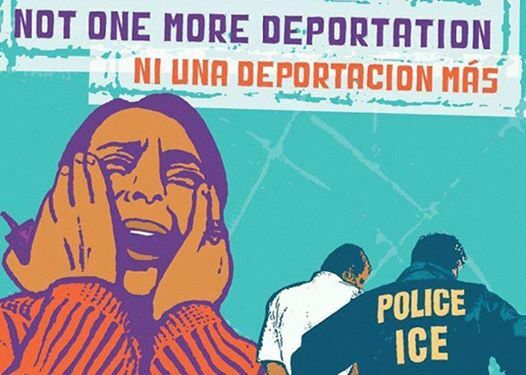 For our neighbors facing deportation, they don’t know if they will see their families again, or if they’ll be returned to a country that is no longer home and may be dangerous for them. Civil disobedience is its own language of peace. With this intentional action, for which we accept the consequences, we are saying that continued deportations and detentions are unacceptable. It is wrong to arrest and detain valued members of our community. It is wrong to traumatize children of these families by leaving them without parents and without income. 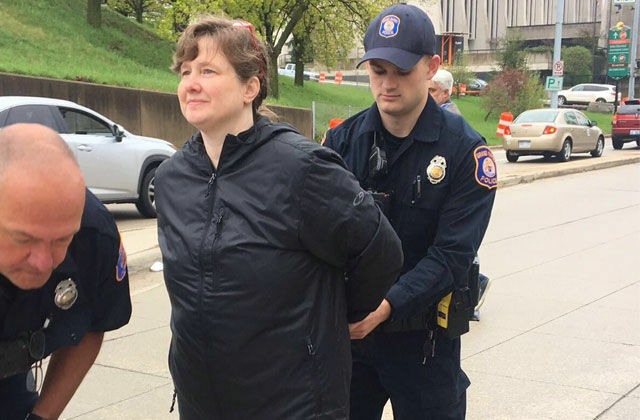 I do not take this action or my arrest lightly, and I do not believe I am particularly brave for being part of this. I know that I benefit from white supremacy and underpaid immigrant labor everyday. What must happen - from this arrest and the upcoming strike, and from the growth of this movement - is that the public demands permanent protection for our immigrant neighbors, family, and friends. We need them and they need us. Join me in standing with our immigrant families, on May 1, 2017 and beyond.